VHL or von Hippel-Lindau disease is a genetic form of cancer. The VHL gene controls the major feeding pipeline of every tumor. Curing VHL is one step closer to curing many other forms of cancer. Our vision is to Curing Cancer Through VHL! The VHL gene is in all of us, helping to suppress the growth of tumors. Those with a flaw in this gene are prone to develop tumors throughout their bodies. Researchers are racing to identify and control the pathways that allow tumor growth in VHL and other cancers. Progress provides hope for all of us by Curing Cancer through VHL. Founded in 1993, the VHL Alliance (VHLA) is the world's leading organization supporting von Hippel-Lindau Syndrome. We are a 501(c)3 nonprofit dedicated to improving the lives and optimizing the treatment of those affected by VHL while aggressively pursuing a cure. The VHL Alliance is a leading funder of VHL research, committing $2 million to support studies seeking a cure. Since the VHL gene controls the major pipeline that feeds every tumor, its cure brings us closer to curing many other forms of cancer. Suellen's family always thought that VHL was an eye disease. Her mom was 25 when she was diagnosed, and shortly thereafter, went blind. Today, Suellen has lost her mom and uncle to cancer and her brother, two of her children, and several of her grandchildren have all been diagnosed with VHL. In reality, her entire family has been affected by this dreadful disease. Please join them as they continue to raise funds and awareness through VHL and fight to Cure Cancer through VHL. Fight Cancer. 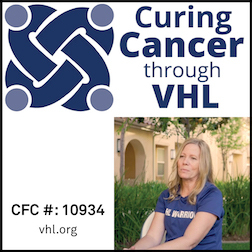 Support Curing Cancer through VHL!